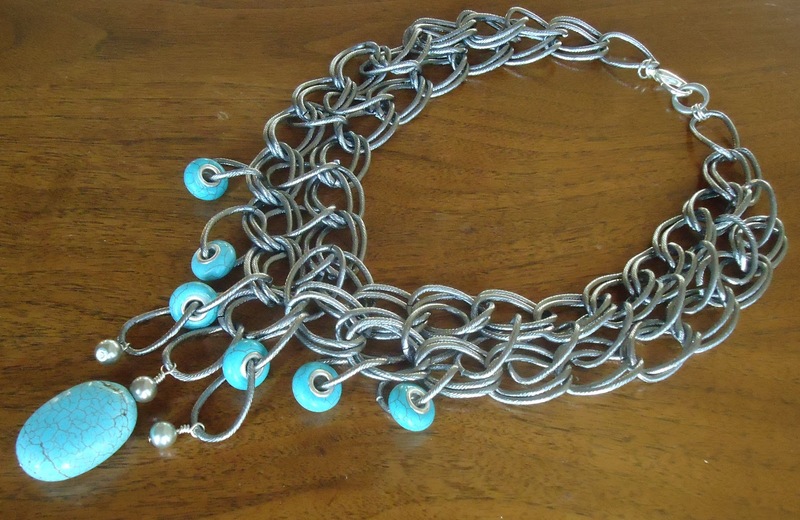 Turquoise embellishing large chain links for Spring, 2013. One of the reasons I have not been blogging over the past month is that I am preparing for a spring show in Edmonton, Alberta, Canada and now that it is a week away, I pretty much only have to price my wares and make a piece or two to round out the choices. I am leaving via Vancouver where I will spend a couple of days and maybe pick up some jewellery findings and semi-precious stones. Of course, the basis of my work is in turquoise and sometimes a piece evolves from whatever components sit and stare at me for a significant amount of time. 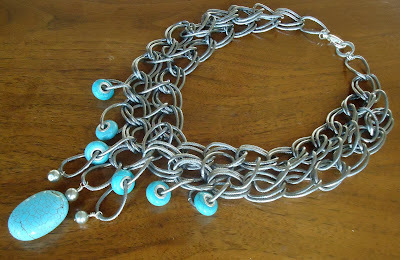 And so it was with this piece as I pondered how to use the last of the big link chain and a 6 pack of turquoise donuts. I do not buy much in mass amounts just because it forces me to be unique in my designs. Unfortunately when someone asks if I can make them another exactly like "this one", my answer is often no. Semi-precious green stone with oversized spheres for Spring, 2013. Although I find turquoise something of a chameleon that can be worn with many different colours and outfits, green, according to Panetone, is the colour for Spring, 2013 and so I created a few in the jade tones and some lighter shades of green. Over the past five years of making jewellery, I have noticed that statement necklaces are becoming a basic rather than just a trend. 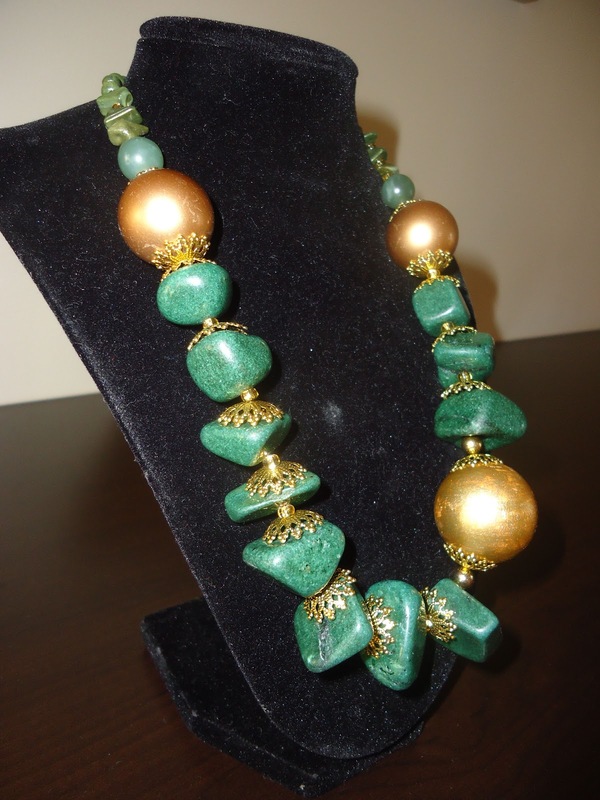 More women are choosing big and bold and the statement necklace is becoming a "must have" necklace. I have been making pieces with large links, huge chains and over-sized beads for a good while and just when I think that the more delicate will overtake the "trend of the moment", Chanel (see slide 61 on the Harpers Bazaar link) places giant pearly baubles at the wrist and at the neck, as they did again for the spring of 2013. It doesn't seem to matter whether it is night or day, the statement pieces are being worn at work and play. Even a t-shirt and jeans become a palette for the artistry and design of a signature piece. Just be advised that with all the "bigness" in both earrings and necklaces in the spring of 2013, keep the clothing simple and understated. Absolutely stunning new designs!!! Even I, jewellery challenged as I am, would wear either of these pieces with pride!! You are kind and I appreciate the feedback. You never know when the opportunity might come your way to wear something I have made. My mother always said that when no one says anything it means that it is at the very least acceptable. And so with your comment, these pieces may be just a tad above acceptable. I am always striving for that. Thank you very much.